We’ve been working hard for the last year on adding other new things to this desktop environment. The latest release of ArcGIS Pro supports customization. What’s coming is more analytics, support for vector tiles, mobile map packages, and better metadata. Also, based on a lot of feedback from you, we will support concurrent ArcGIS Pro licensing in version 10.4. 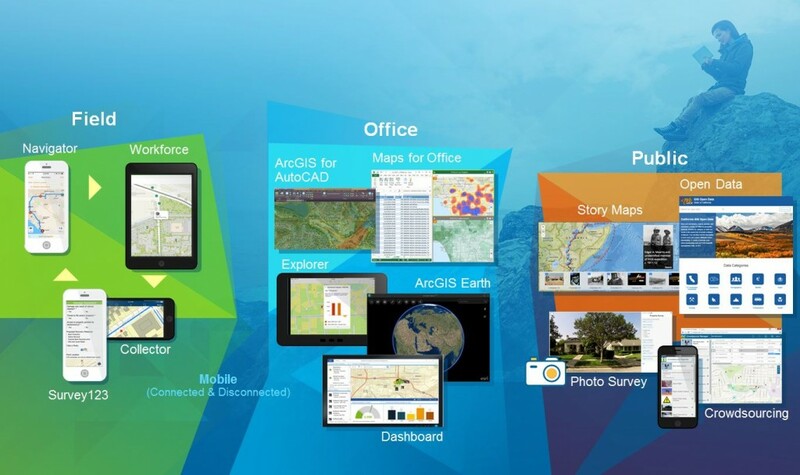 One of the things that’s making ArcGIS come alive is apps. Apps are opening up the ArcGIS platform, making it available to everybody in your organization as well as to the public. We have three main areas that we’re working on: field apps, office apps, and apps for citizen or public engagement. In the area of field apps, Collector for ArcGIS is great, but where do you go? There’s a navigator app. And then what do you do when you get there? There’s a workforce app. So all of these apps work hand-in-hand to support field workers. 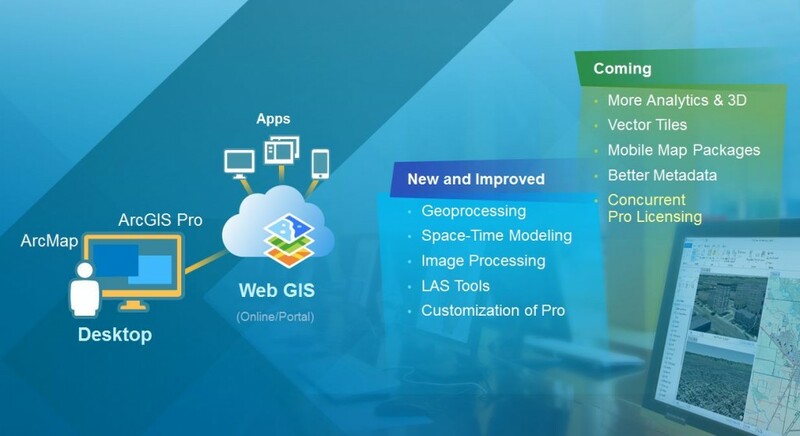 Apps give you easy, focused, ready-to-use, and configurable solutions that work together to make ArcGIS available everywhere. In the office area, there are many new improvements. And in regards to public apps, we’re continuing to expand the reach of story maps and the open data app. And then there are new crowdsourcing apps that allow you to empower citizens by getting the voice of the crowd and integrating it directly into your GIS. If you want to build your own app, we have three mechanisms to help you do that. Web app templates are HTML5 and are easily configurable. There is a new Web AppBuilder that, since its release in January, has already resulted in tens of thousands of apps being built and deployed. This fall, we’re introducing a new builder called the AppStudio for building native apps. AppStudio is a native app builder that allows you to build the app and automatically deploy it on Android, iPhone, and Windows.. It lets you design it once and then implement it anywhere. For developers, we’ve “opened up the hood” of ArcGIS, exposing not just the apps and the templates that can be configured, but also runtimes. We have a rich library of open APIs, runtimes, content, and services that are integrated in all the different languages. This enables you to build our own applications for the enterprise and beyond. Last year, ArcGIS for Server was enriched with Portal for ArcGIS. This brought web mapping and the whole geoinformation model into the enterprise so you can have your own Web GIS inside of the organization, with the apps that I’ve mentioned and with total integration with ArcGIS Online. ArcGIS for Server supports both on-premises and cloud platforms. Recent improvements include 3D web scenes, more analytics, support for the Microsoft Azure cloud, and stronger support for Linux. What’s coming next is the big data extension for GeoAnalytics, a new utility network, support for GeoJSON and the Google cloud environment, improved geocoding, and also support for distributed portals. 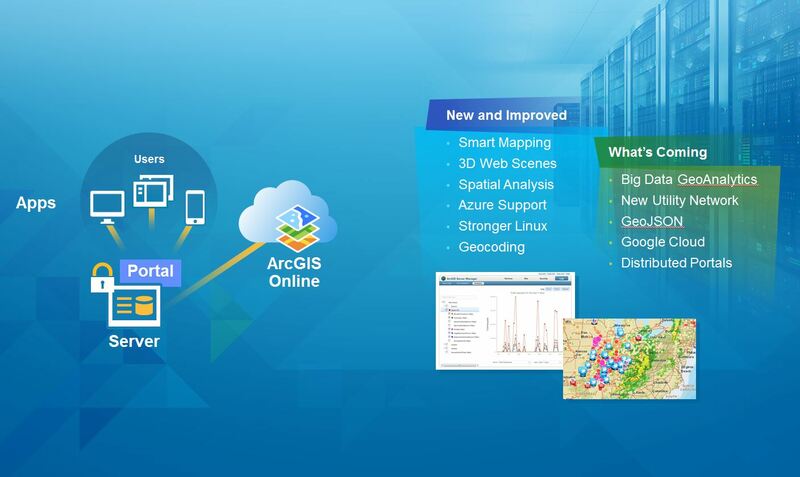 ArcGIS Online is the complete hosted GIS in the cloud, supporting mapping and apps. Additions to this component have included smart mapping, formal metadata, better administration, and high-performance geocoding. What’s coming is improved search, so we can find each other’s work more effectively, advanced analytics, better support for OGC standards, and Bing map support. On top of these main pillars are what we call solution templates. There are now several hundred of these that you can use to make GIS come alive at the application level in your organizations. They’re configurable, built on best practices, free, and open sourced, and we also support them as part of the ArcGIS product. With more than half a million downloads, solution templates are helping users be successful with ready-to-use apps and maps. Complementing these templates is a family of solution products. These are commercial products for supporting high-end map production in organizations like cartographic agencies around the world; or decision-support environments for uses such as real estate and business location, business analysis, and community analysis; or also the new world of geodesign to create and quickly evaluate the consequences of a design. Additional solutions products support specialized areas such as highways, airports, and advanced field data collection. We are incrementally releasing the ArcGIS product, and we’ll continue that this winter with the release of ArcGIS 10.4. The online environment is in a state of continuous development, and a number of new themes will be realized this winter.